It is that time of year when the hustle and bustle starts…holidays, parties, shopping, etc. I don’t always think of it in those ways. It is not often that I share anything about my meditation/prayer/spiritual practices. For me it is very personal. I am not called to proselytizing. This morning, however, I just felt compelled to share a purposely distorted image of today’s view as I was sitting in my quiet time. Different people call it different things…prayer, meditation, sitting…but I was meditating on sharing and in particular, sharing happiness. My quiet times are a place where I share my concerns, my desires and my happiness and I believe that reaches into the world and affects others, if only in a small way. I sit with representations of people I love, as noted by the stones and things in the image. They change on any given day, as I am drawn to certain thoughts, needs and people. I don’t live close to my immediate family and the upcoming holidays are always a reminder of that fact. I hold them in my heart always, though, and that inspires me in many ways. Nothing particularly creative here today…just me, my thoughts and my hopes for everyone to have people they hold dear to them, whether literally near to them or not. Be thankful and think on that as we get ready for a day when many may not be thinking of a lot more than eating and watching football on that busy day called Thanksgiving. After all, it is not about the turkey on the table, but the “turkeys” sitting around it!!! I am grateful to have much love in my life from family and friends. They each hold a place in my heart with a shape reserved only for them! Love to all! A good day to stay inside…and play! Today we got our first snow where I live and it is still coming down…about 4″ to 6″ so far, with freezing rain expected. I love it…it is pretty, even though gray out there. As I have said, I would not want to live where the seasons don’t change. Remember those pretty fall colors from my kitchen window post? However, I digress! This weather gives me great cause to stay inside, yes. 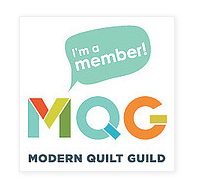 And do things I really enjoy…like my sewing, quilting, crafting, painting, etc. I am known to have multiple projects going on at once, for sure. 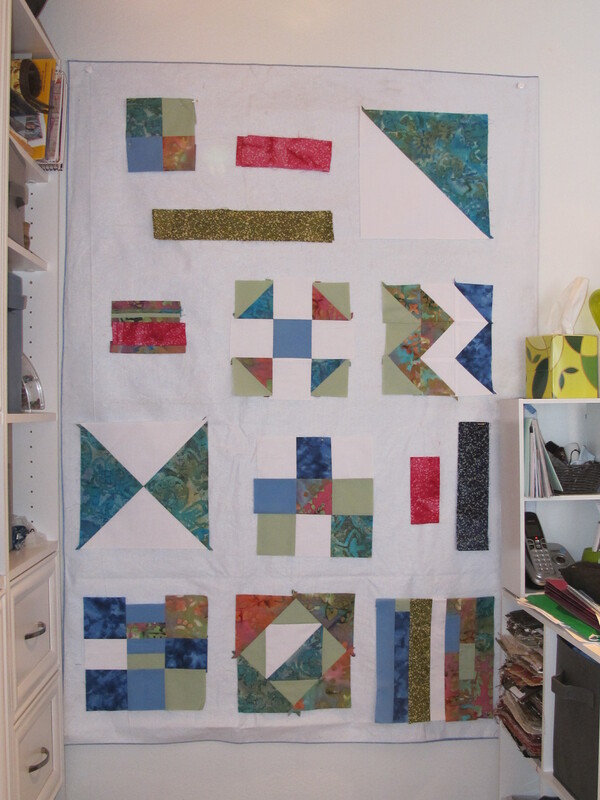 Today I am working on my first REAL quilt top. 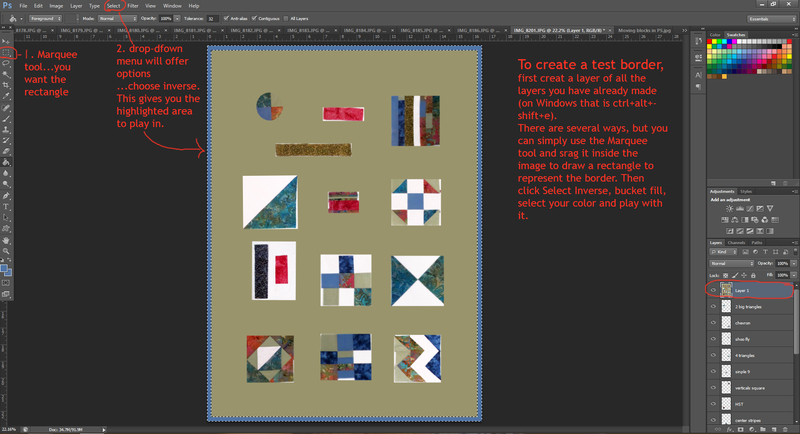 I feel good about how it is coming out and want to share some ideas for how to plan the layout of your quilt top. 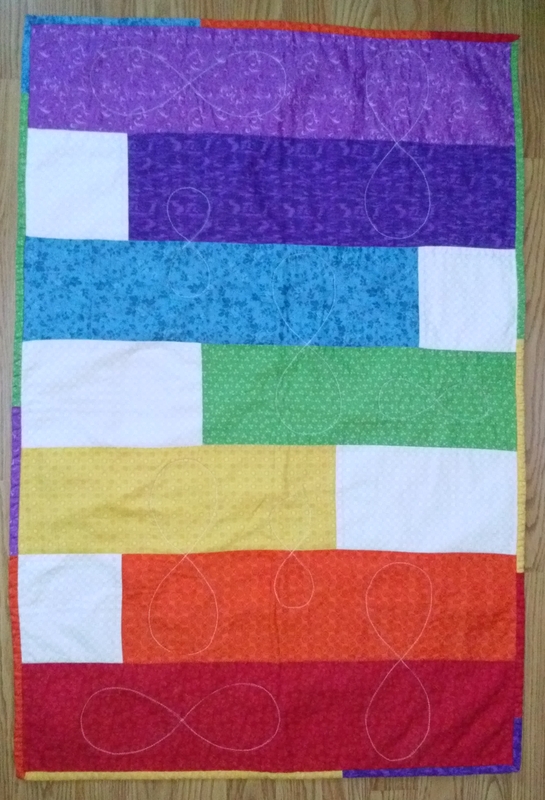 I want to thank my friend and muse, ModJBrown, for inspiration and getting me started in quilting. Other inspiration is Quilting Line and Color by Yoskiko Jinzenji. My thinking is way over my head relating to my level of experience, but this is me…just jump in! I am using 3 main batik prints and 3 plain colors. The blocks are traditional patterns like shoofly, chevron and lots of HSTs, with the layout leaning to modern style with lots of negative space. 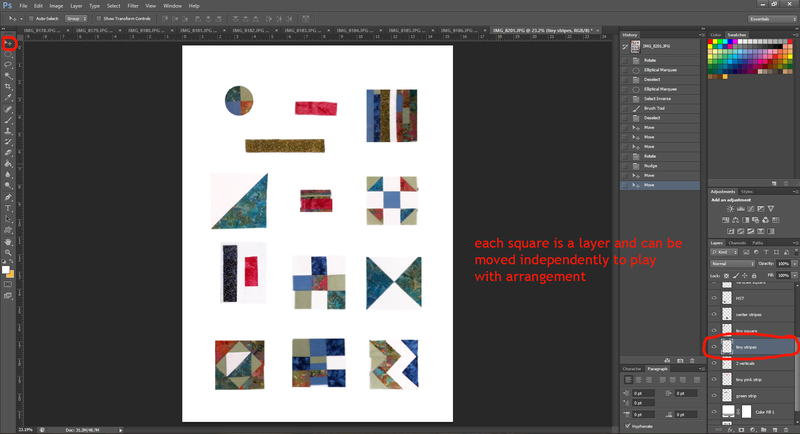 Let’s see what I am up to today…Below is one easy way to work with your pieces. With a piece of batting (or a fleece-backed vinyl tablecloth) hung on the wall, you can just stick your squares and pieces to it…voila, they stay in place! Moving them is easy! Ok, that said, I wanted to play a bit more with fill-in colors and borders. Now keep in mind, I have never done a written tutorial, but I do use Photoshop and if you do too (or Elements or even some other programs most likely), you can really start to see your work take shape right before your eyes. 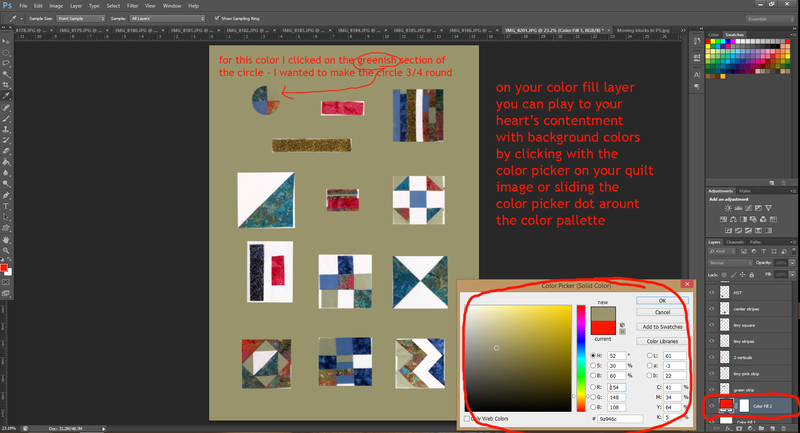 A screen capture of my Photoshop file where I have created a layer of each quilt square or piece. This is done by taking a picture of each square OR cropping a piece out of one original image to create each layer (I used the image taken on my wall to crop from.) Create a base layer of all one color…I chose white, thinking this may be my actual final choice. By using the move tool (upper left corner), you can select any layer and drag it wherever you would like to try it. Remember, I said I think I want my background color for the quilt top to be white, but hmmmm? I can create another fill layer in Photoshop and change that color to anything I want to try! (Or, just change the color of the white layer too…even easier.) There are text notes on the image above about just where to click, etc. You will also notice that it isn’t perfectly clean because of the crop on each square, but it gives you a great feel for the colors and how they will work together. Ok…now you have an idea on the color for the background. What about the border? Well, the image above shows a simple way to create a border space and change that color, as well. Of course, you can make that a pattern fill, gradient fill and more, but we are trying to keep it simple here today. As pretty much a novice here, I would love to hear how you plan. Please share a comment! As you a likely a creative yourself, if you are reading this, you may know as much or more about this than me, but if you need more details on the Photoshop process, leave a comment! I am happy to share anything I can with you. In the meantime….I am off to play! My final decisions are not what shows on the pictures here, so I hope you will drop back by to watch for the finished quilt. Hope you are having fun too!!! As I was posting a new category to my Etsy shop… http://www.facetfully.etsy.com … called “catchalls”, it made me think about that word. First, I would have to check if Webster has deemed it a real word yet. Second, we all have them and all use them: pencil holders, paper clips, jewelry, safety pins, business cards, computer wires and gadgets, buttons…and this is a short list of what I see from my desk chair right now! Maybe we don’t really need them, because we have so much stuff and should clean up, but I find that every time I do that I end up missing something I got rid of! The thing that really spoke to me though, was the third thing…our heart is our biggest “catchall”!!!! Everything seen, touched and experienced in any way filters through our hearts. It is our choice where it goes from there. 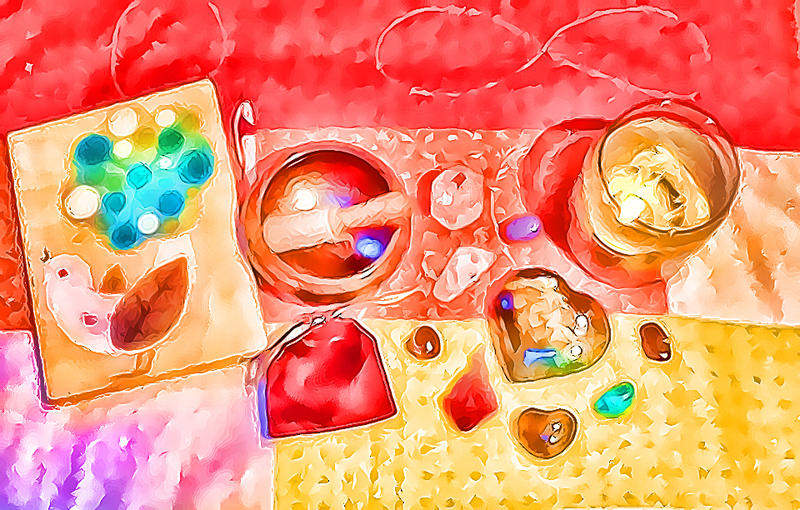 There are many things that I hold dear in my “heart catchall” and would not want to clean them out! The negatives that run through there, well, I try my best to let them go to make more room for the positives. I hope your “heart catchall”l is full today!